Monday we slept in and ran down to breakfast just in the nick of time. Then we packed up, checked out, and took a taxi to the MTN station (to go to the airport). When we got to the station we noticed that you could check your bags in straight to the airport (at the corresponding airline counter). 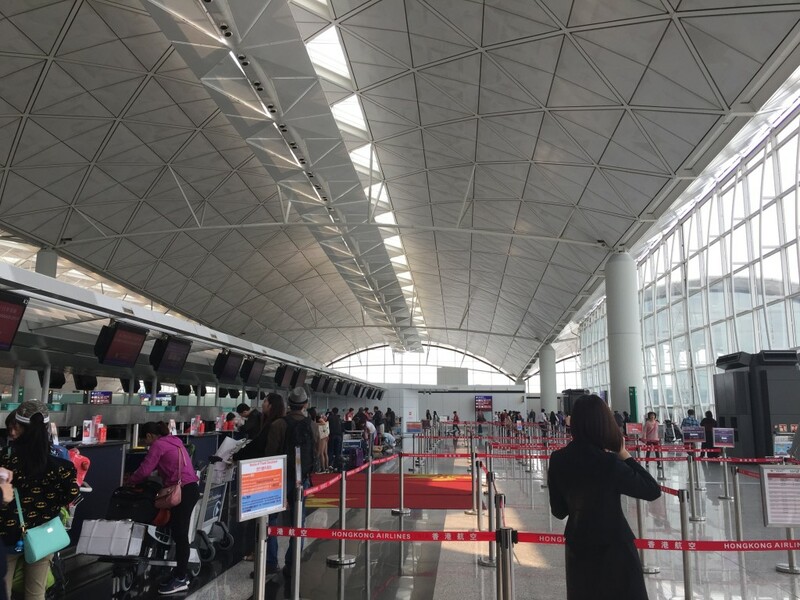 According to our tickets we had a flight leaving at 2:35 PM on Hong Kong Airlines, however, when we got to the counter they told us that we were not on the flight and to speak with Shanghai Airlines. Annoyed, we ran over to Shanghai Airlines, where they told us our ticket said Hong Kong Airlines. We went through a whole rigmarole with them only to get sent back to Hong Kong Airlines, while on the phone with United Airlines. After an hour of back and forth, we left on the MTN to the airport, with our bags, unsure of which airline we would be flying and what flight we might be on. The Hong Kong Airlines counter at Hong Kong airport. We got to know it well. At the Hong Kong International Airport we went to the Hong Kong Airlines counter where we were told that we were not confirmed on the 2:35 PM flight. It seems that our airline tickets were booked but never issued. We were then directed to the United Airlines counter, where they got on the phone with the people from the desk at the Hong Kong Airlines. 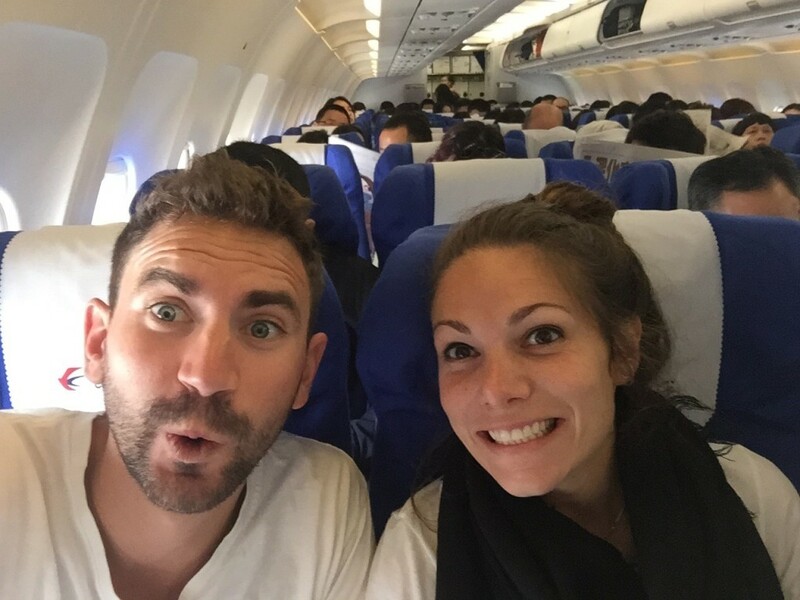 United Airlines told us we needed to go back to Hong Kong Airlines because they might have room for us on the flight. 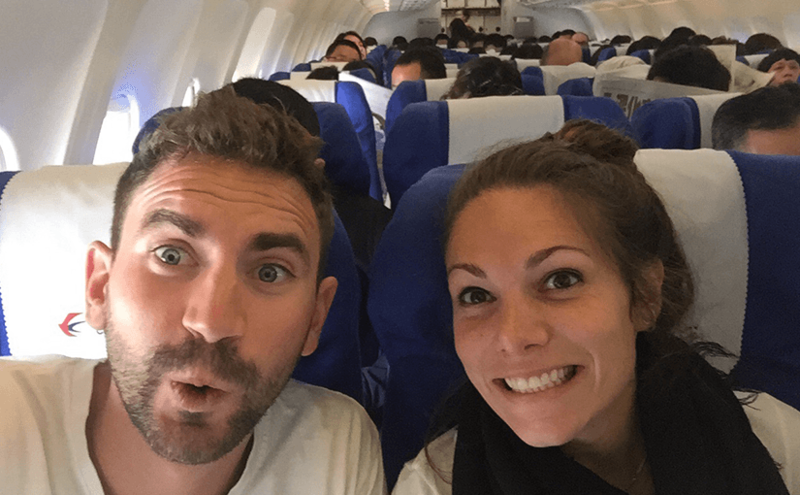 We explained to them that we were just there, and that there was no room for us, but after more back and forth we went back to Hong Kong Airlines, only to hear that we were now confirmed to definitely not be on their flight. So, we went back to the United Airlines counter where they then offered to help us. One of the women managed to find us a 3:10 PM flight on China Eastern Airlines to the Shanghai Pudong International Airport (closer to where we are staying than the airport we were meant to fly into). Delighted to finally be on a flight, we went through security, grabbed sandwiches and boarded a bus from the terminal to go to the plane. China Eastern Airlines was definitely not as nice as any of the Thai airlines we had flown but it got us to Shanghai, so we were happy. Finally on the China Eastern Airlines plane headed to Shanghai! 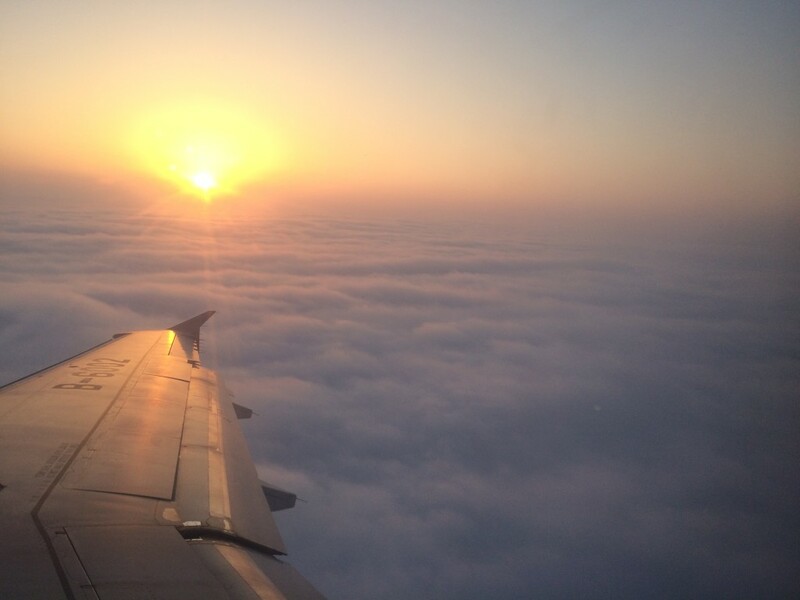 Window views by Daniel—on the flight from Hong Kong to Shanghai. Sunday morning we woke up early and took a taxi to the top of the Hong Kong Peak (Daniel’s father gave us this advice to avoid waiting in a two hour tram line). Unfortunately, when we arrived, the fog was so thick that we couldn’t see a thing. 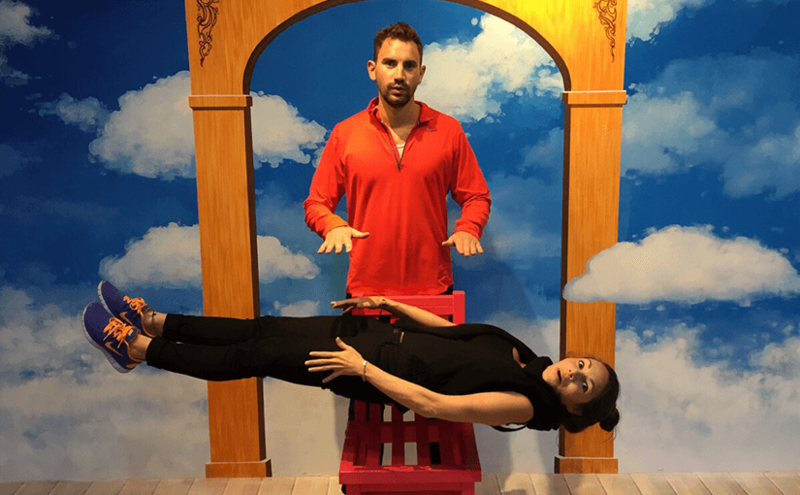 We figured that maybe if we waited an hour visibility might get better, so we headed into the shopping mall and found a local attraction known as the Trick Eye Museum. 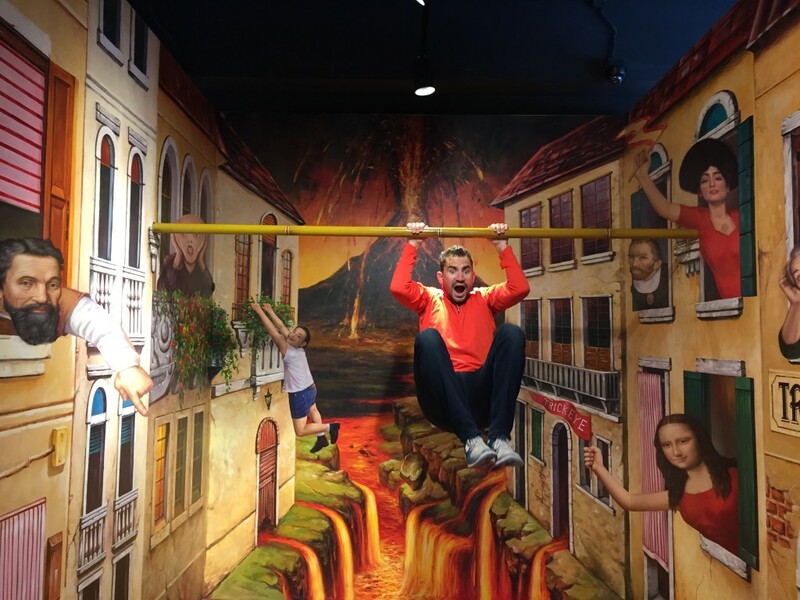 The “museum” was basically a few interconnecting large rooms filled with different paintings, illusions and props on the walls and floors where you can pose and take awesome photos. Now I know that the expression goes, “the early bird gets the worm,” however, we were there so early, there was no one else to help us take photos of ourselves. So we posed solo for many of these scenarios until we found someone to snap a few photos. I should probably be embarrassed to admit this, but I absolutely I LOVED this place. 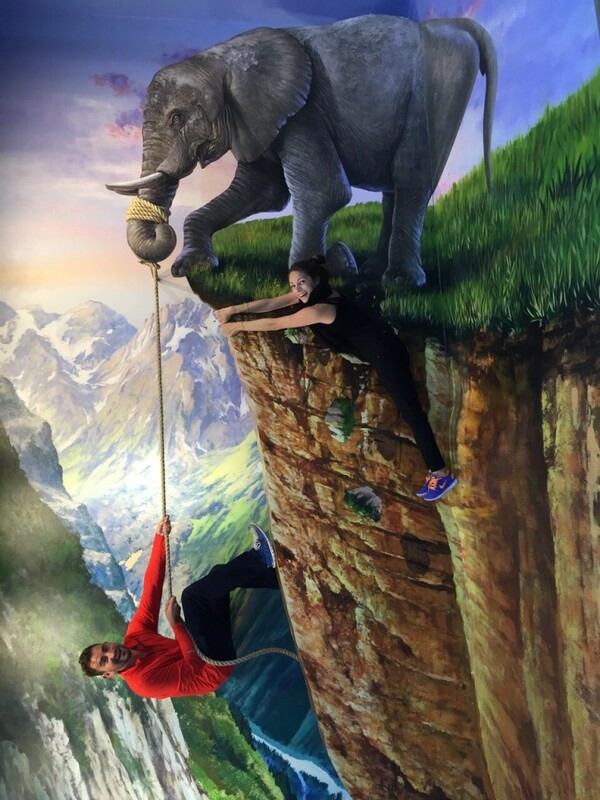 Things are a little different here in Hong Kong! 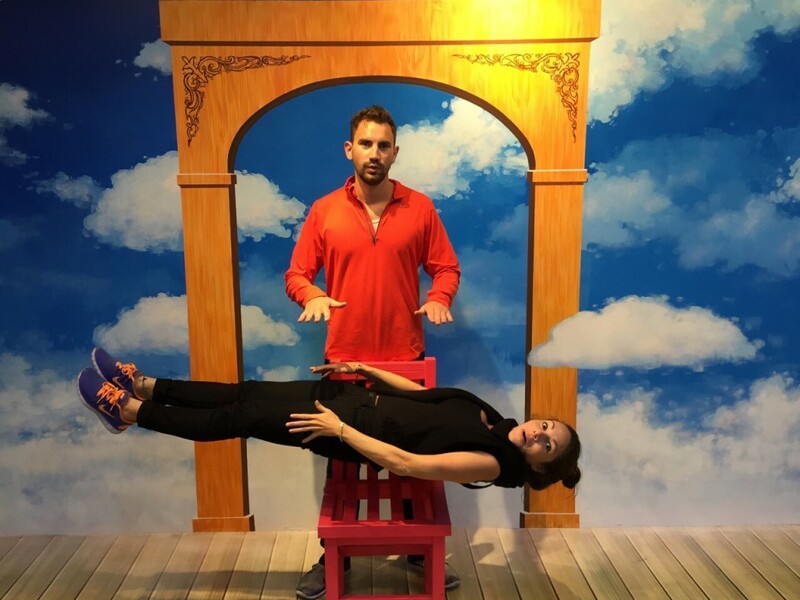 Daniel practicing his voodoo magic on me again at the Trick Eye Museum Hong Kong. FIRE in the hole! Good thing Daniel is wearing his Nike dry fit. Shake your coconuts and hang loose. Can’t take the safari out of the African boy. Good thing he saves himself in the face of danger. When we left the museum the fog was still there and the visibility was still pretty much non-existent—but we figured we’re here, let’s take the tram down to Central. We bought tickets and hopped onboard with zero wait time. 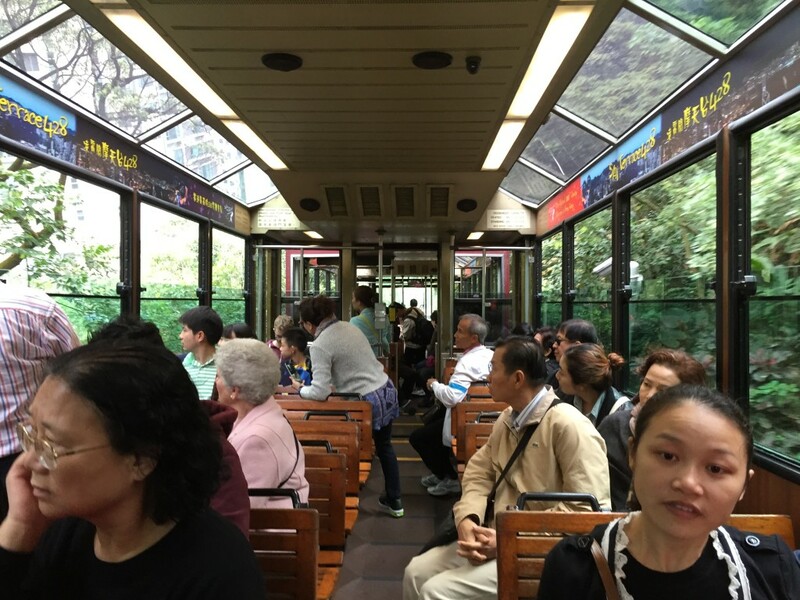 The tram went down the peak at a 45-degree angle. It was pretty cool, but it seems like a more serious version of being a tourist and riding a San Francisco cable car. 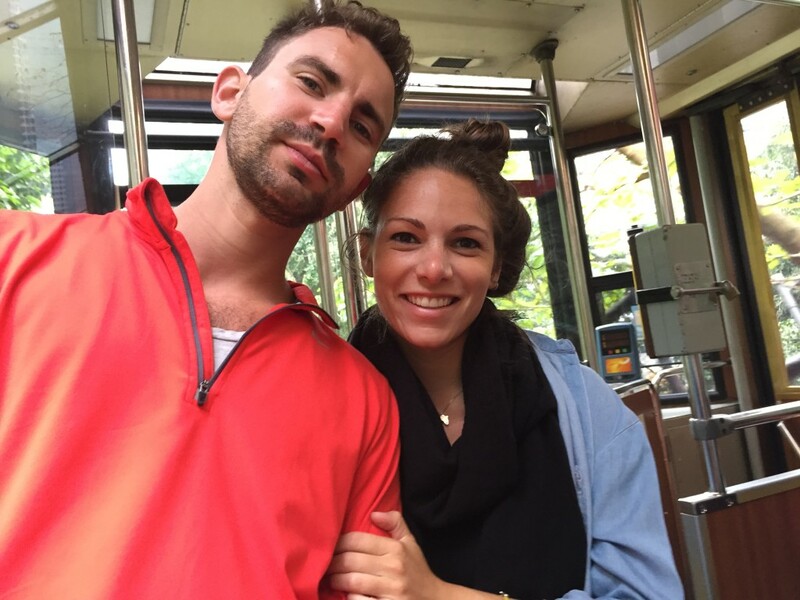 On the Hong Kong Peak Tram—photo courtesy of the couple behind us who took 45 shots as they couldn’t figure they’d already taken 44. When we got to the bottom we walked to another famous attraction called PMQ (Police Marital Quarters). 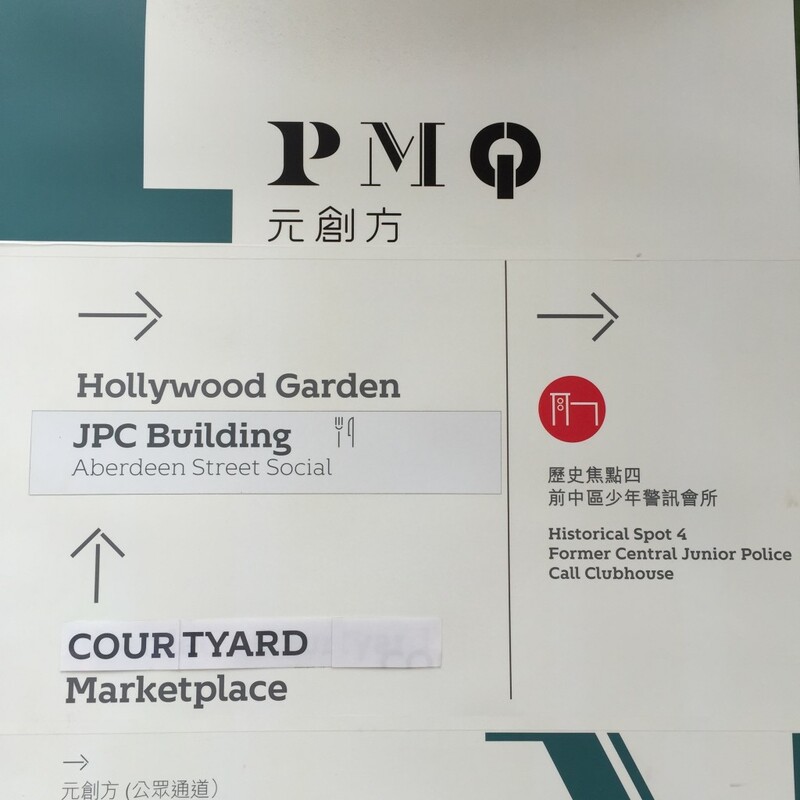 PMQ is where Hong Kong used to house police families, but now it is more like a artsy/cultural center. 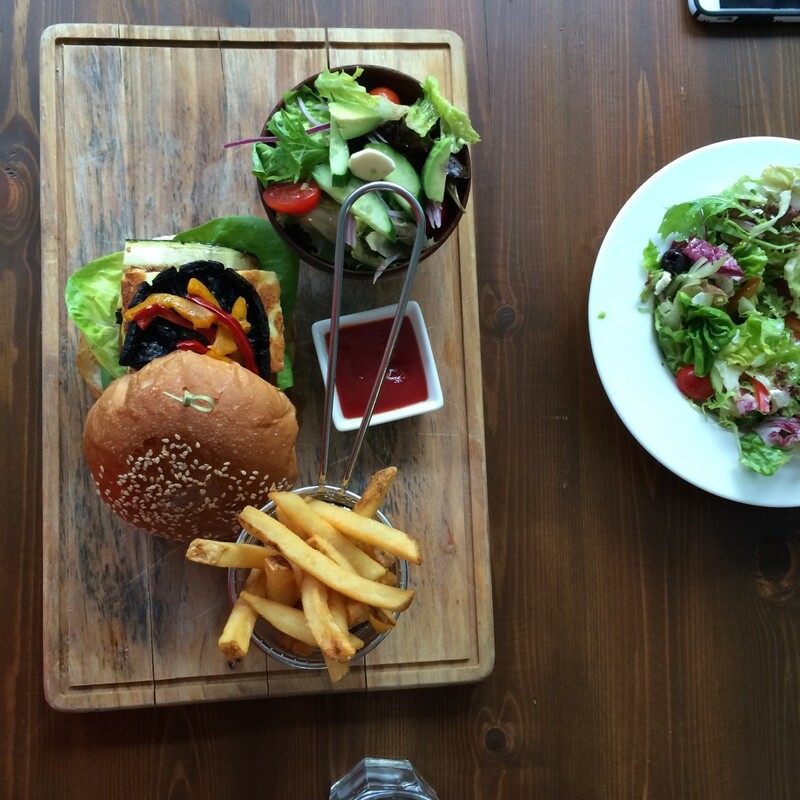 There are plenty of cool café’s, dining spots, shops and local artisans selling goods. Even though it was a Sunday, it wasn’t yet 3:00 PM, so many of the shops weren’t open. We decided to grab lunch at a place called Wilbur’s Burgers—Daniel got a Happy Hippie Vegetarian Burger and I got a poor excuse for a vegetarian burrito before leaving. Daniel always seems to have better ordering luck here. PMQ building in Hong Kong. Art in one of the tiny shops that line the rooms in PMQ. Lunch at Wilbur’s Burgers—Daniel got a Happy Hippie Vegetarian Burger and I got a poor excuse for a vegetarian burrito before leaving. Daniel always seems to have better ordering luck here. My poor excuse for a vegetarian burrito although it was quite picturesque. 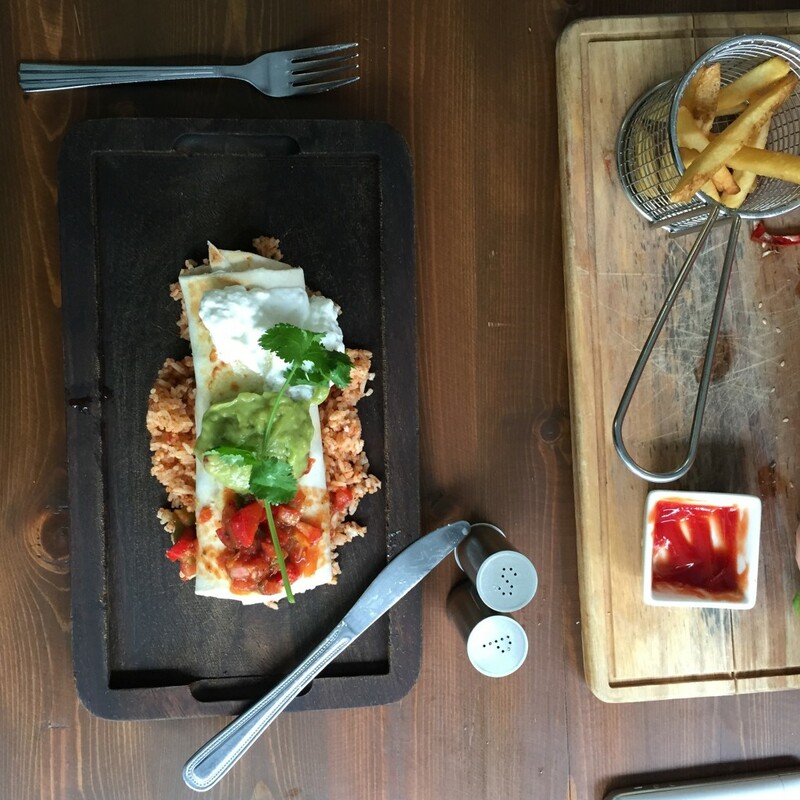 It tasted more like Peruvian food than Mexican. We walked down Hollywood Road for some window-shopping and navigated some side streets to check the trendy gadget shops. 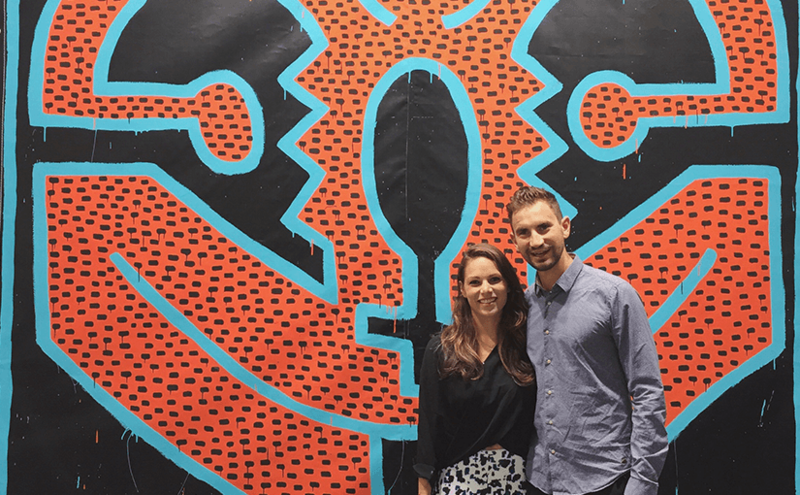 We went to Elephant Grounds, one of Hong Kong’s most highly rated coffee shops, and then walked over to Art Central to check out the local exhibition. The place was super cool, but couldn’t have been more crowded. We spent an hour looking around, had a glass of wine, and left. We walked through Hong Kong Park (it kind of reminded us of Dolores Park in San Francisco) which was full of people picnicking, kids playing, and even a random performance, to get to the MTN station, which we took to get to the Ladies Market in Kowloon. 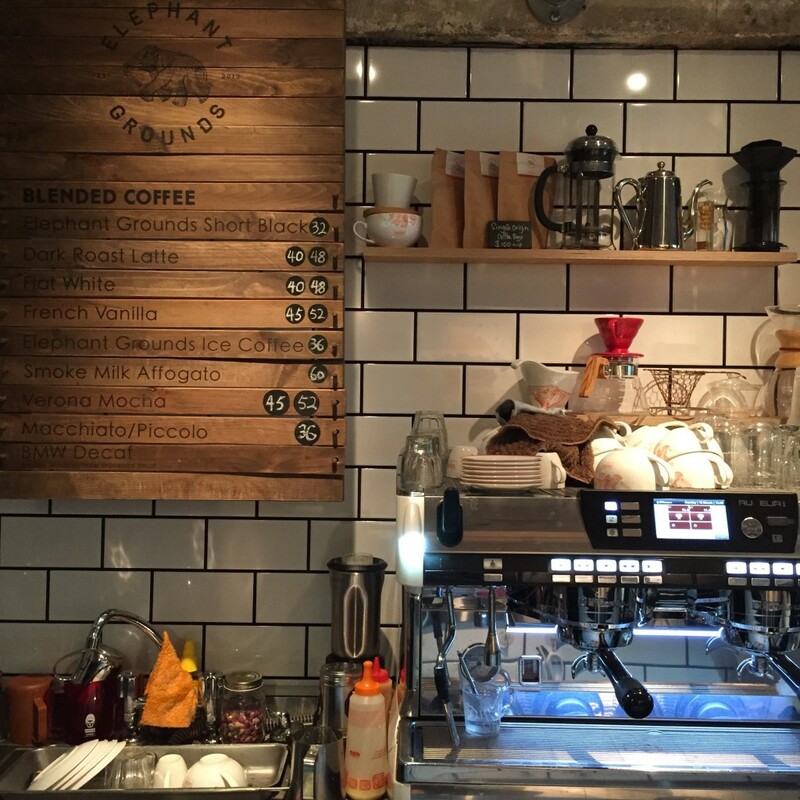 Elephant Grounds Coffee in Hong Kong in the back of a little store on Gough Street. 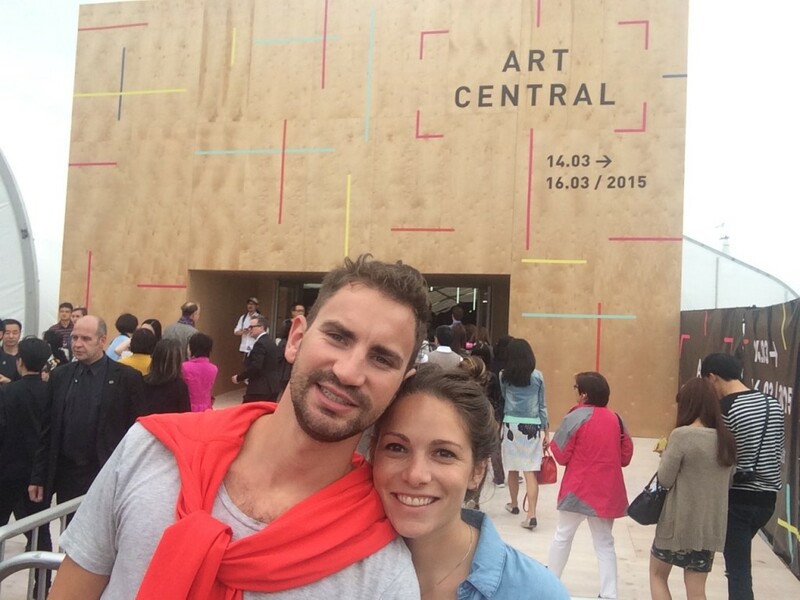 Abusing our selfie stick outside of Art Central in Hong Kong. 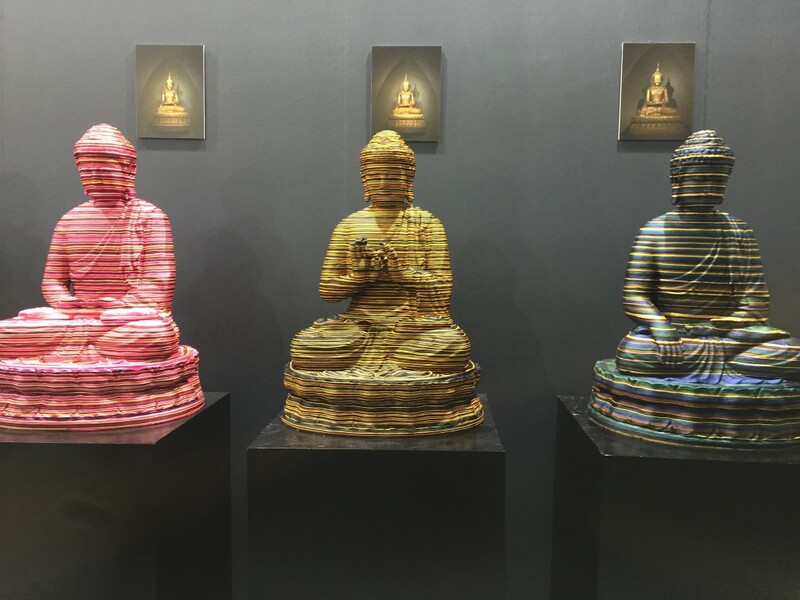 Silk wrapped Buddha’s in meditation poses at Art Central. The Ladies Market, and its surrounding streets and shops, is not for the faint of heart—this area is hustling and bustling. The first thing we noticed when we got off of the MTN was that there were seven Nike stores (all selling “real” Nike shoes and apparel, of course) within a block and a half of each other . Then we went to Mong Kok Computer Center aka heaven for nerds aka heaven for Daniel. 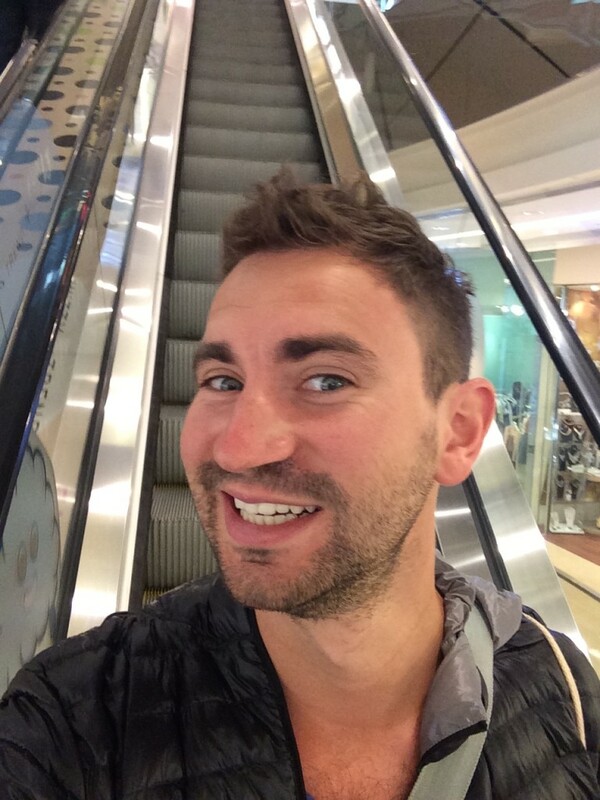 I’ve never seen him so truly happy to be in any type of shopping environment before. He lit up as we walked through the four-story electronic mall—each shop selling different varieties of the same of phone cables, computer parts, GoPro accessories, security cameras, selfie sticks, covers, cases dangles, dongles, etc. 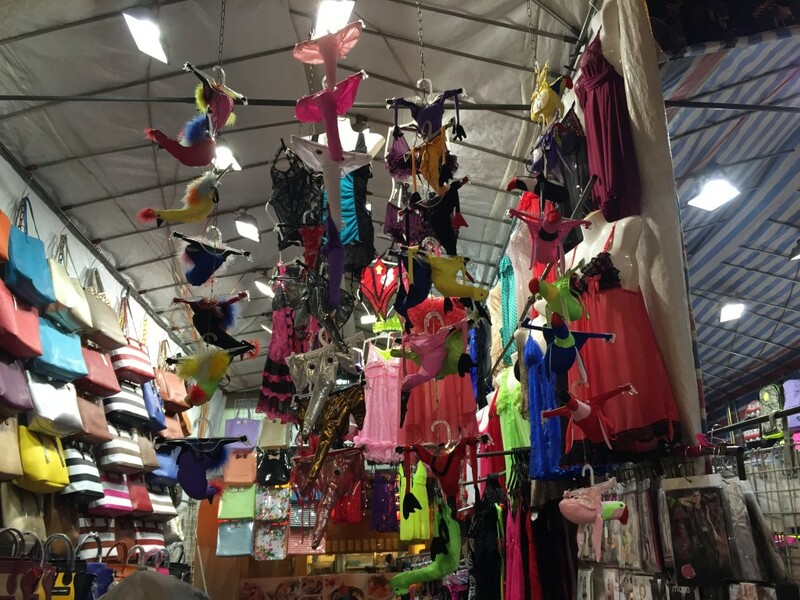 We bought a few things there and then headed out to take on the Ladies Market night bazar. Stereotypical posing outside on the street of the Meng Kok Computer Center near the Ladies Market. 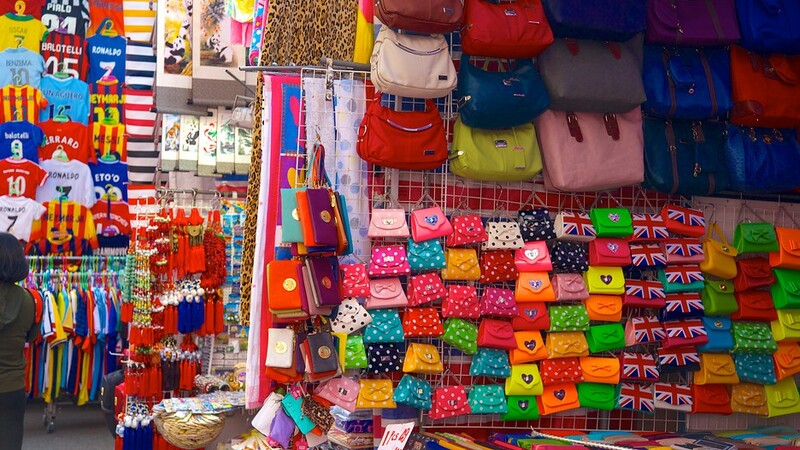 The Ladies Market was filled with all of the usual night bazar things you’d expect to see—mainly fake bags, wallets, glasses, jewelry, watches, wigs, kitchen appliances, man-thongs, woman-thongs, bras, traditional Chinese attire, etc. Sometimes the people who run the different booths—under their breath—will approach you and say things like: “I can find you Rolex watch”, “I sell you real designer handbags,” “I sell real nice wallet just for you, good price”—so funny. We found few things for ourselves, but mainly gifts for other people. At one point a man who I’ll refer to as Peanut (because of the large gold peanut charm he wore on his necklace) chased us down the road until he had my attention. When I looked at him, he smiled like he knew me—but when he realized I was confused he asked me if I remembered him. Obviously, I said “Sorry, I don’t know you” at which point he proceeded to pull out his phone and go to his photos, while telling me he saw me at his shop. For a moment I figured he might have had a really good memory, because it is entirely possible that I did see him in a stall somewhere. He then showed me a photo on his phone of him and a girl wearing a similar blue shirt with brown hair in a bun… definitely not me. Then he seemed a bit embarrassed, apologized, and told me it was confusing for him because lots of American’s look the same. Such a funny stereotype reversed. 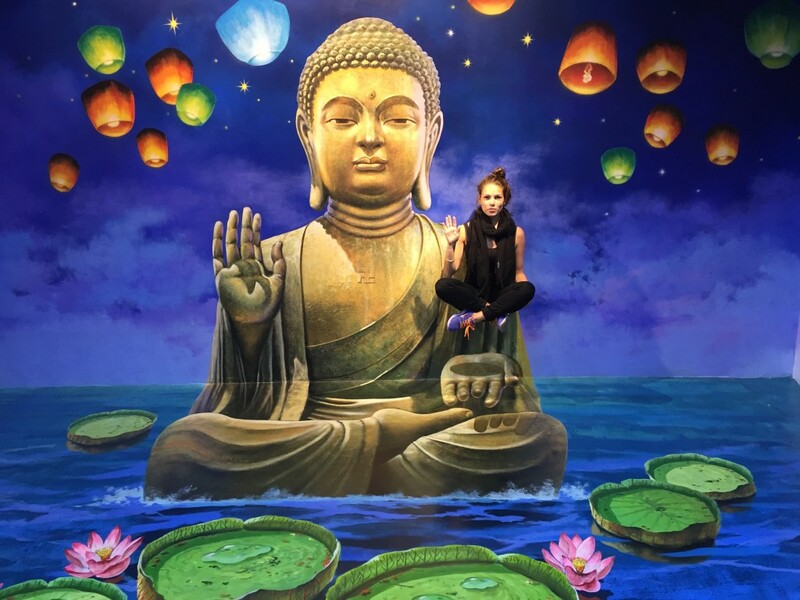 Real fake everything at the Ladies Market in Kowloon (not our photo). Elephant man-thongs at the Ladies Market. As to why they sold these at EVREY stand, I have no clue. I mean, would you buy this? Exhausted from being on our feet for twelve hours, we took a cab to Elements Mall for dinner, found a Japanese restaurant called Sen-Ryo, which turned out to be the most delicious authentic conveyer-belt sushi ever! I’m not exaggerating when I say that it put most sushi we’ve had to shame. 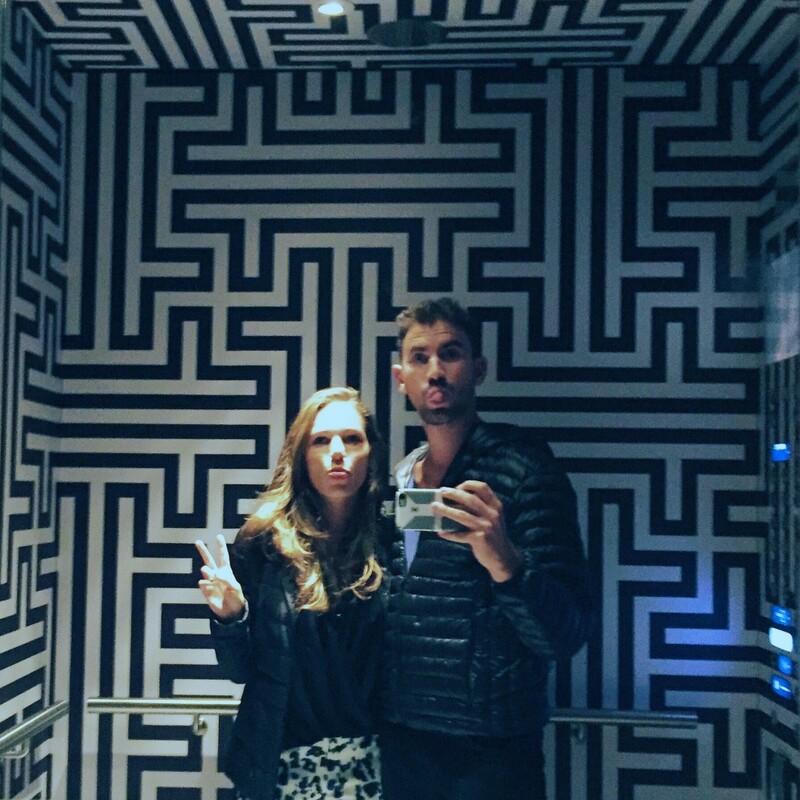 We felt like we couldn’t have had a better end to the night… but then we decided to go to Ozone Bar, the one at the top of the Ritz Carlton. Ozone bar is the tallest bar in the world, sitting on the 118th floor of the hotel. 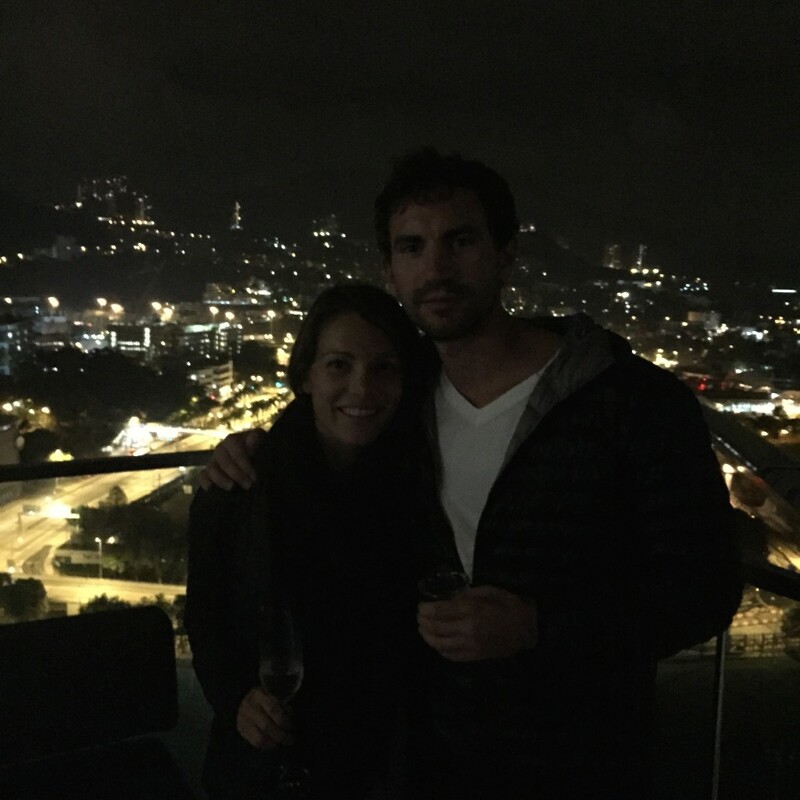 We went up, checked the view, took a photo, saw the drink prices, and turned back around to leave. What a busy day! This is Elements Mall—the mall where we found Sen-Ryo conveyor belt sushi. 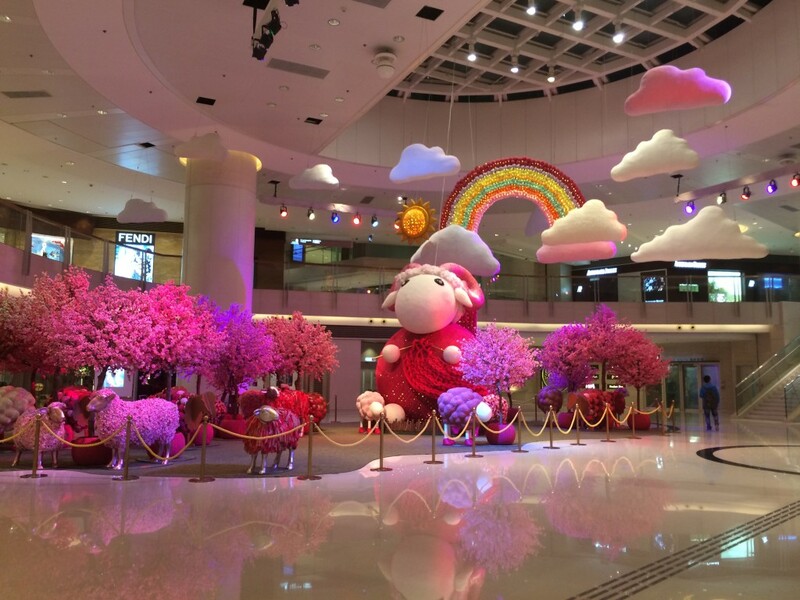 Good things happen to those who follow the rainbow and the fake sheep covered in cheery blossoms. 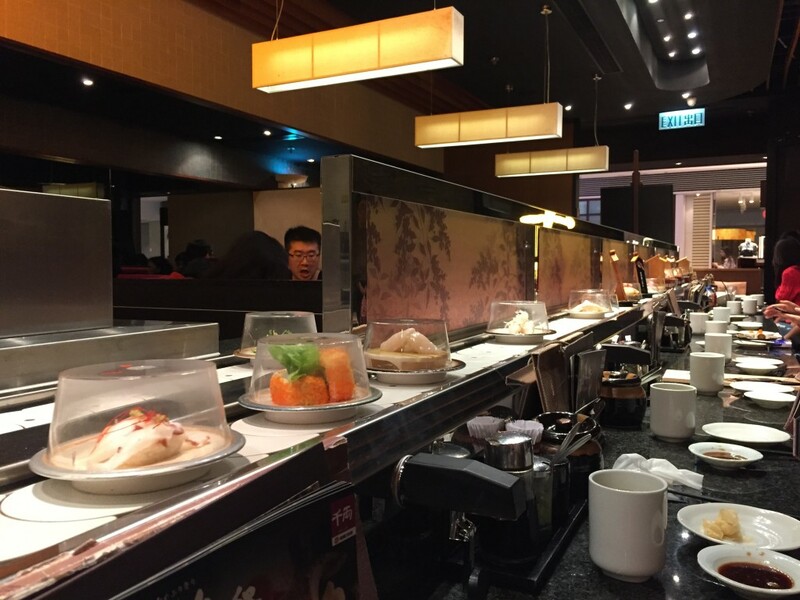 Sen-Ryo Japanese Sushi Bar conveyer belt. Such a delicious meal! 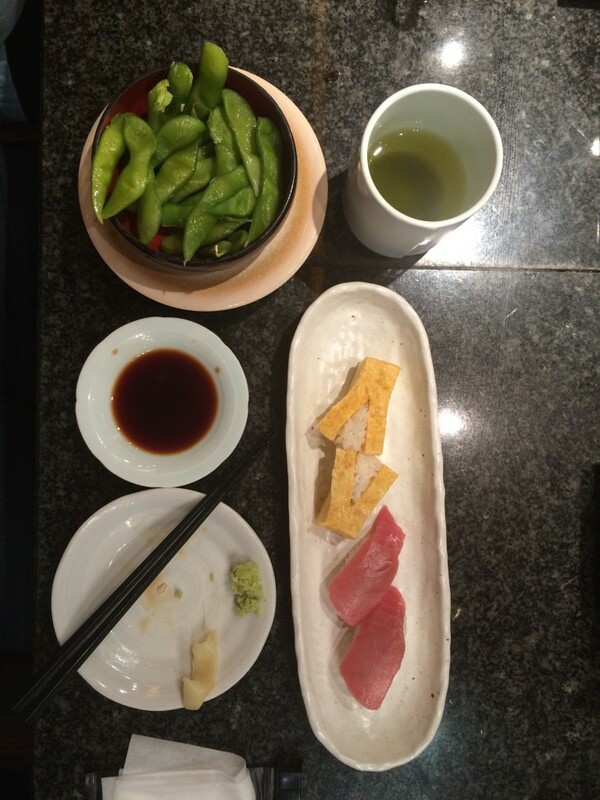 Sen-Ryo sashimi and edamame. There was even a personal hot water tap at each seat to make green tea. Selfie in the glass reflect at Ozone Bar—what a great view! 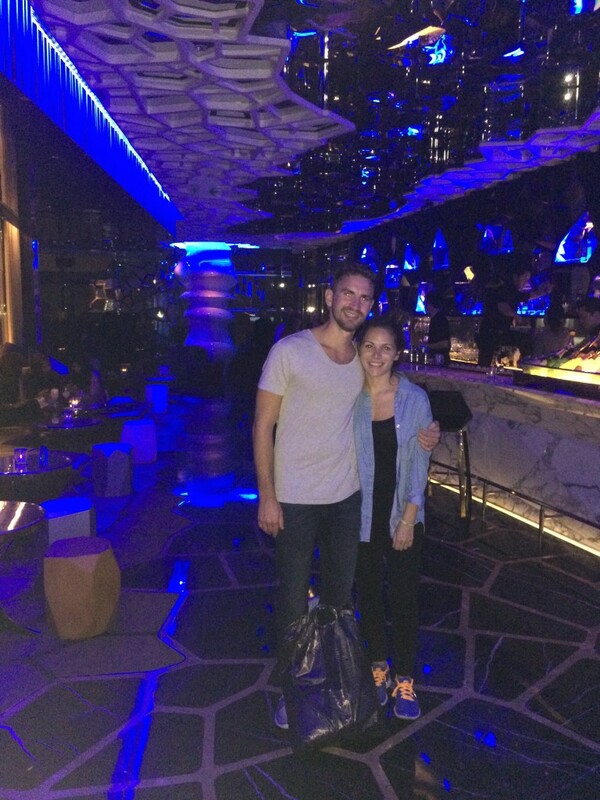 Ozone Bar is the tallest bar in the world, sitting on the 118th floor of the Ritz Carlton. We went up, checked the view, took a photo, saw the drink prices, and turned back around to leave. Saturday morning we had breakfast and took a double decker bus to Stanley Market. The bus felt like it came out of Harry Potter—we moved so fast, managed to fit on roads, and around curves that seemed way too narrow, and met a warlock (well he never claimed to be a warlock, he just wore a hat that resembled that of a sorcerer, a long robe, and carried a cane). We sat in the front row on the top level and were able to check out Victoria Harbor and all of the massive fancy homes on the hillside. 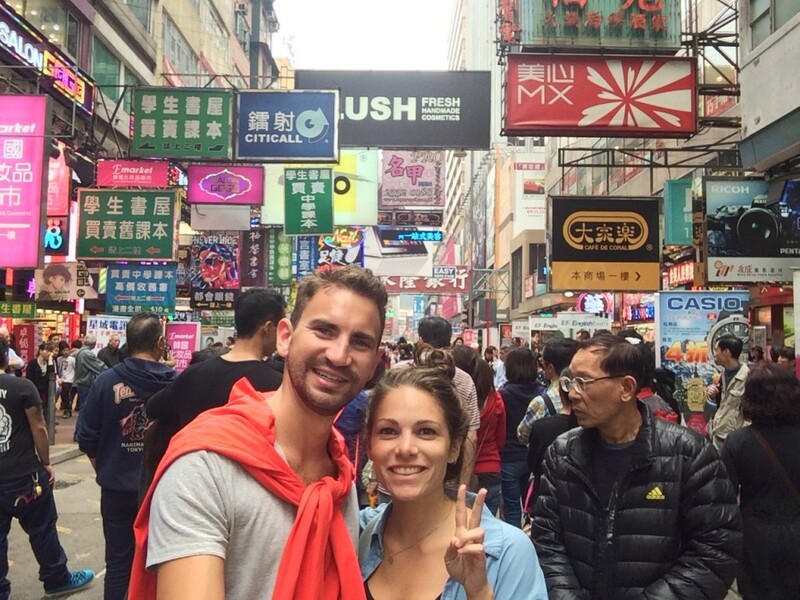 We spent about an hour walking around Stanley Market and then headed back to Central Hong Kong to grab lunch. We went to Oliver’s Super Sandwiches where we shared one of the worst sandwiches we’ve ever had. Then we went to check out the Peak Tram only to find out that the wait was over two hours, obviously we didn’t do that. We spent the rest of the afternoon walking around Central (a part of town) before returning to our hotel to get ready for the evening’s festivities. 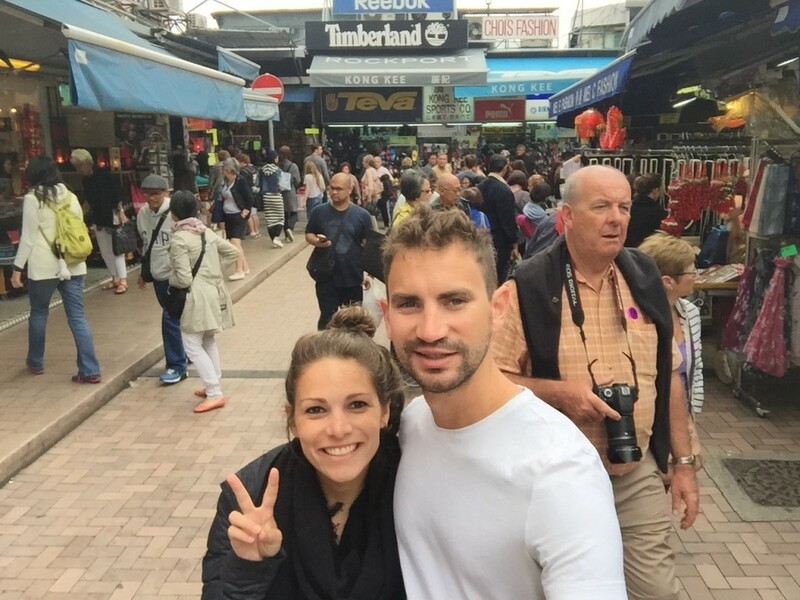 Us at Stanley Market in Hong Kong. 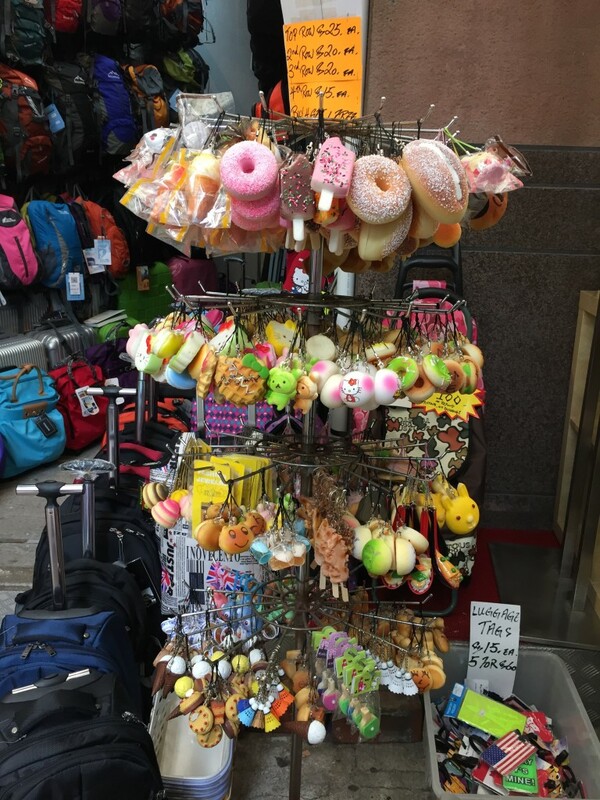 Fun Chinese keychains things in Stanley Market. 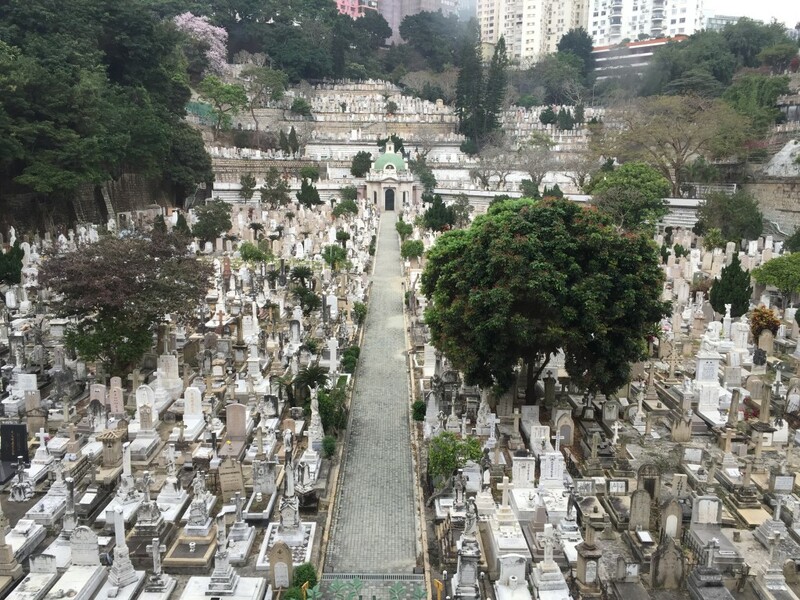 Driving past the Hong Kong Cemetery—this is one of the early Christian cemeteries in Hong Kong dating to its colonial era beginning in 1845. It’s absolutely massive. We headed to the Empire Hotel to pick up passes for Art Basel (thanks to my godmother Ellen) and then to the Hong Kong Convention and Exhibition Center to check it out. The show was incredible and we had an amazing time!!! 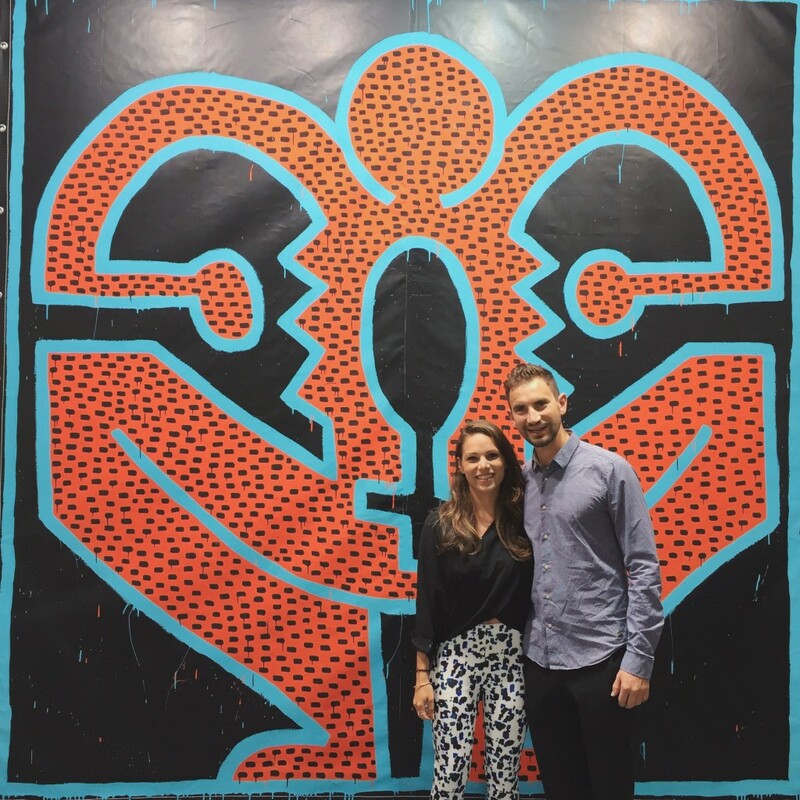 Us in front of a Keith Haring at Art Basel in Hong Kong. 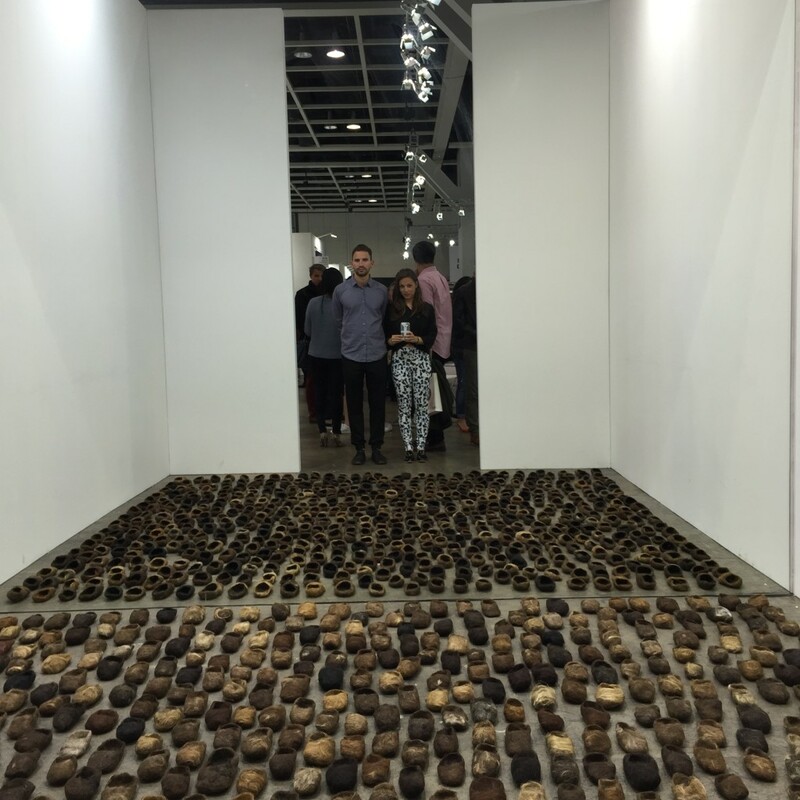 Reflection shot in the mirror over a massive hair piece at Art Basel. We could have spent hours there, but left to go to dinner at The China Club with our friend Justin’s father (Robert), sister (Carly), and family friend (Amir). 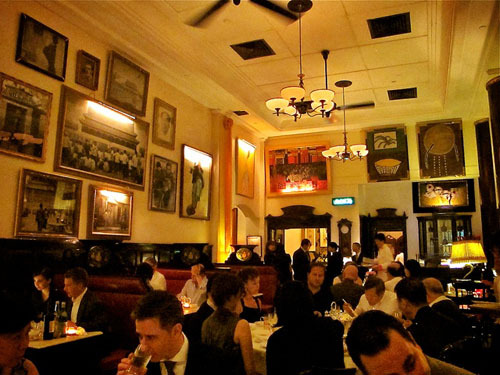 Daniel and I arrived at the Club, which is modeled to look like a 19030’s Shanghai, and were blown away by the exceptional art collection. We were escorted upstairs to the bar where we met Robert, Carly and Amir before heading to the main dinning room for dinner. Dinner was delicious beyond explanation! Robert ordered food like a world-class champion, and we were treated to the most fantastic Chinese food dinner either of us had ever tasted. The China Club and just some of the massive art collection. Not our photo. 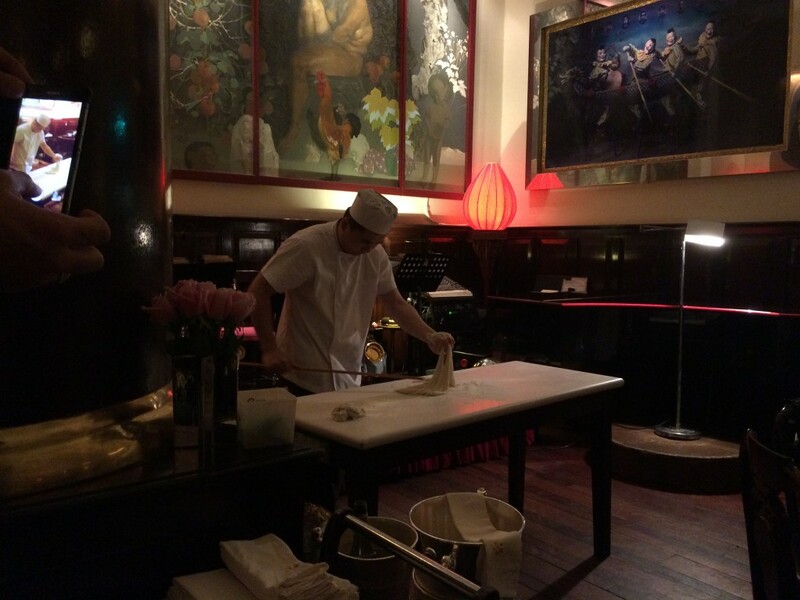 Traditional noodle making dinner show at the China Club. Group photo at The China Club in Hong Kong. Amir, Carly, Robert, Daniel, and me! 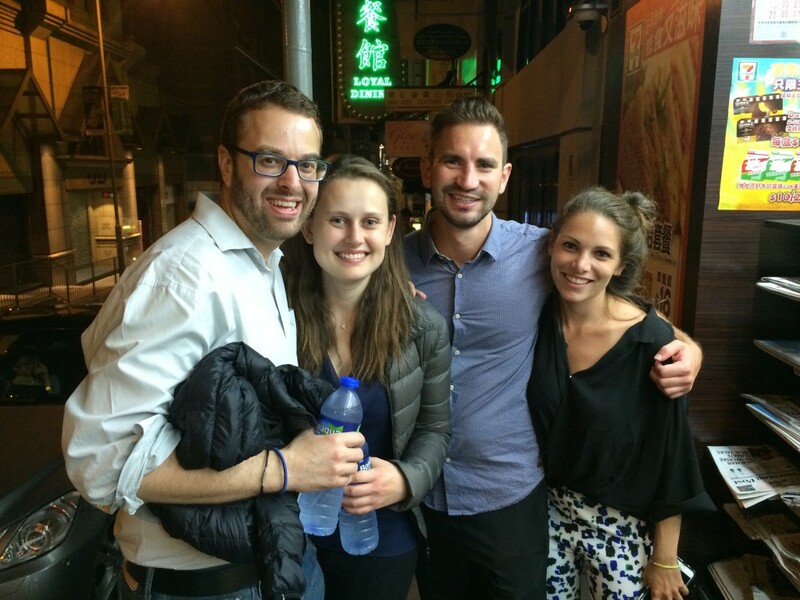 After dinner Carly took us out to Lan Kwai Fong (LKF)for a night on the town with some of her friends—Daniel’s friend Darren from South Africa and his girlfriend also joined us. We started out at a vibey, local, hole-in-the-wall Mexican restaurant/bar called Brickhouse—the place was awesome and served some seriously strong drinks. 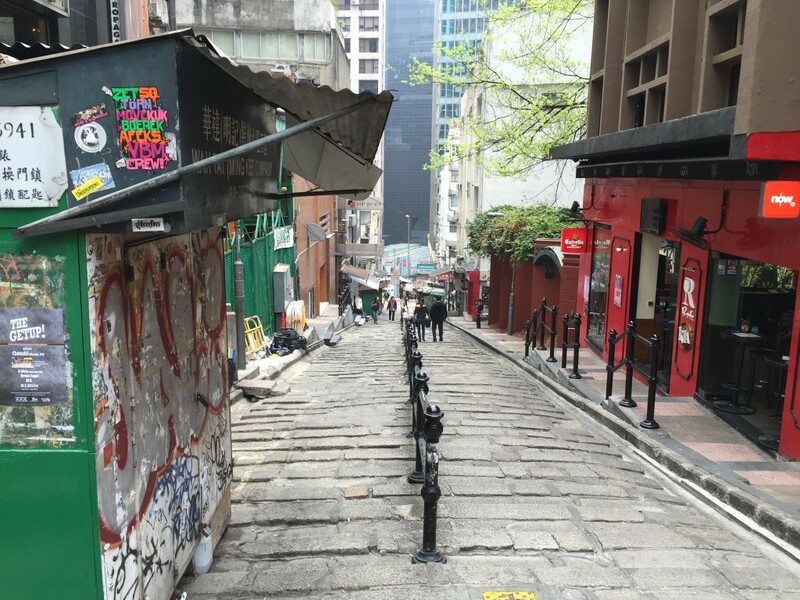 Then we wandered along the densely packed streets filled with people drinking and socializing until we ended up at one of the oldest streets in Hong Kong, Lok Hing Lane. We spent a while longer drinking there before retiring. Out in Shanghai with Darren, Ali, Daniel and me. One of the remaining old streets in Hong Kong, Lok Hing Lane. (Day time shot). We arrived in the Hong Kong International Airport Thursday night around 8:30 PM and were quite relieved to learn that China’s firewall didn’t extend there (aka we could use the internet freely). We took their subway system, the MTN, from the airport to Hong Kong island, and then a taxi from the MTN station to our hotel. The MTN is unbelievable (it incredibly quick, clean, cheap and gets good service. The taxi ride to the hotel was awesome, we got our first glimpse of the city in all it’s night light glory—buildings piled sky high, each one bigger and more modern than the next—quite a contrast from the simplicity of Thailand. 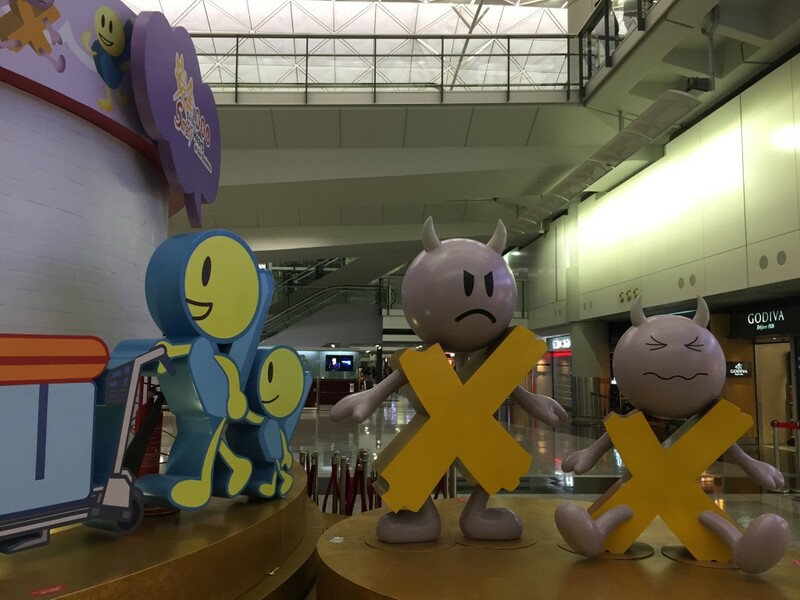 Hong Kong Airport—a love affair at first sight. 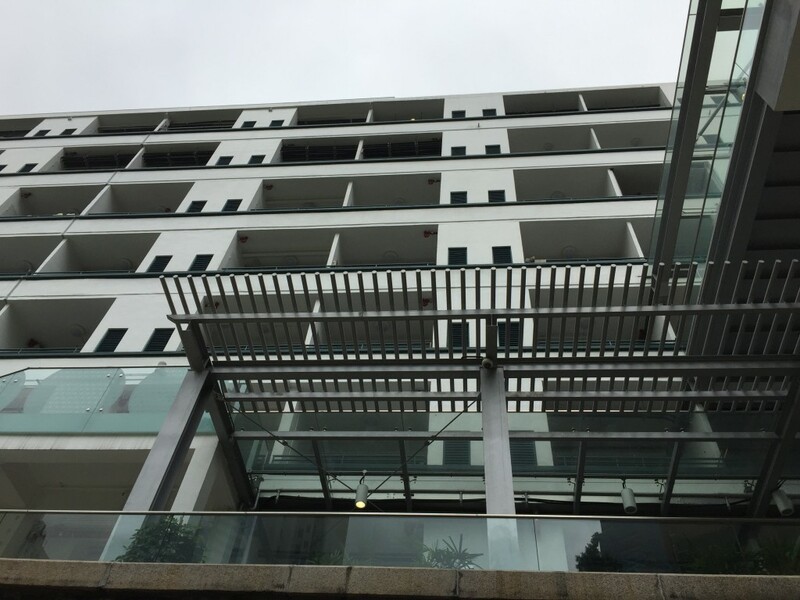 Around 10 we finally arrived at the Ovolo Southside, a brand new hotel in Hong Kong’s up and coming arts district. When we walked inside we were absolutely stunned by just how beautiful the place was. 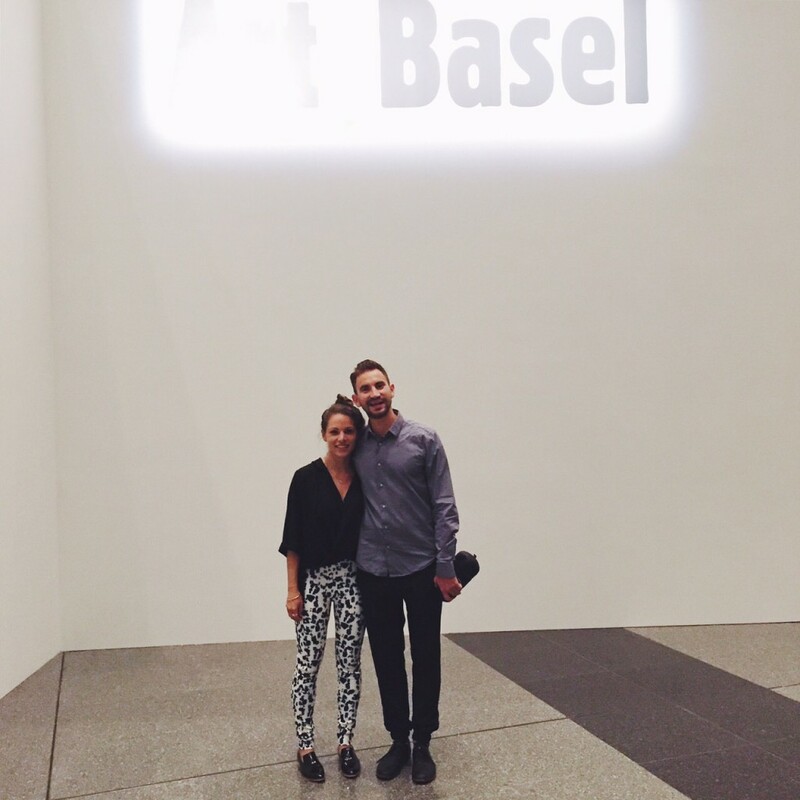 From the views, to the service, to the art (and there was a lot of really amazing stuff) we couldn’t have been more excited. 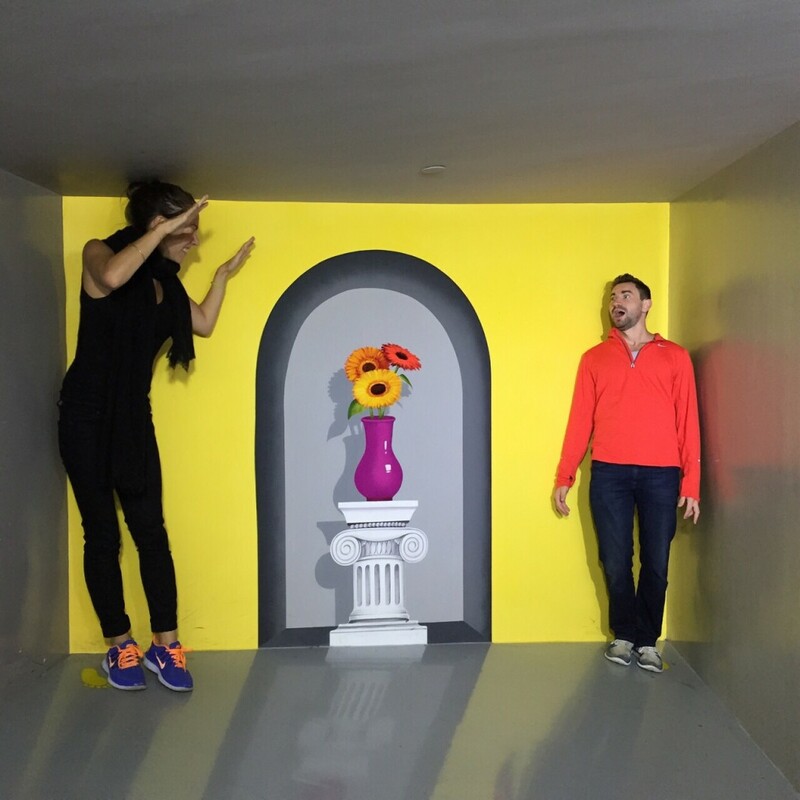 We met the hotel’s manager, Cliff, who gave us tickets to Hong Kong’s Art Central (a local exhibition for up and coming artists that they were sponsoring), and a bunch of recommendations for what to do around the city. 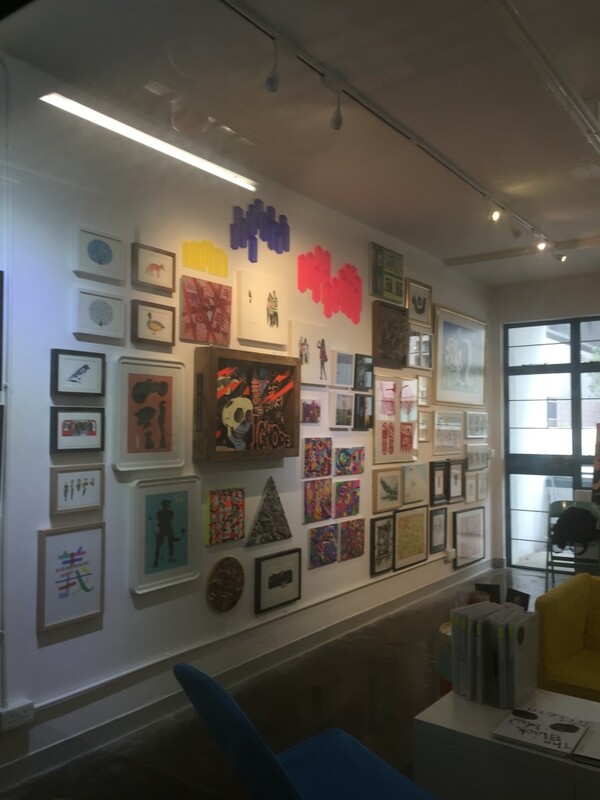 Art in the lobby of the Ovolo Southside Hotel in Hong Kong. 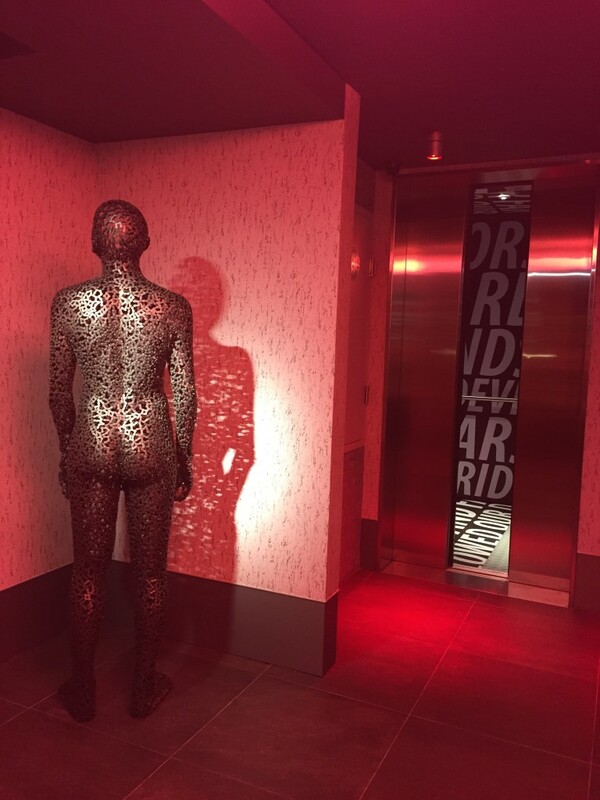 More artwork in the lobby of the Ovolo Southside Hotel. 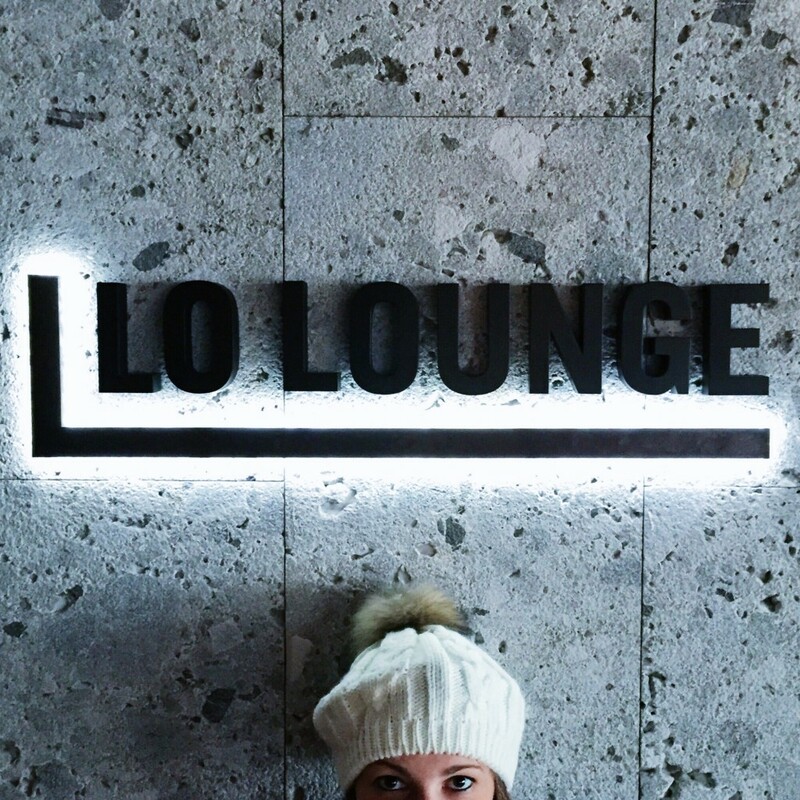 Hi from the Lo Lounge at the Ovolo Hotel. Exhausted and starving, we were shown to our room—a small, but modern/industrial space filled with simple and elegant furniture on the sixteenth floor—and directed to CIRQLE (the hotel’s restaurant) for dinner. The food was outrageously delicious (pasta with truffles, a Moroccan baked eggplant dish with hummus and rice, and truffle fries) and the ambiance was awesome. After dinner we went up to the hotel bar, ABOVE, for a quick drink and to check out the city’s notorious skyline (I got a Prosecco and Daniel got some spicy tequila drink that they pour from a tea pot into a glass with a mint leaf). The temperature in Hong Kong was in the ehigh forties/low fifties (Fahrenheit) that night and both of us were absolutely freezing, especially after being in hot and humid weather for the past month. We decided to hit the hay around 1:30 AM, after coming to the conclusion that we were obsessed with Hong Kong and could see ourselves living here (even though we hadn’t yet left the hotel). 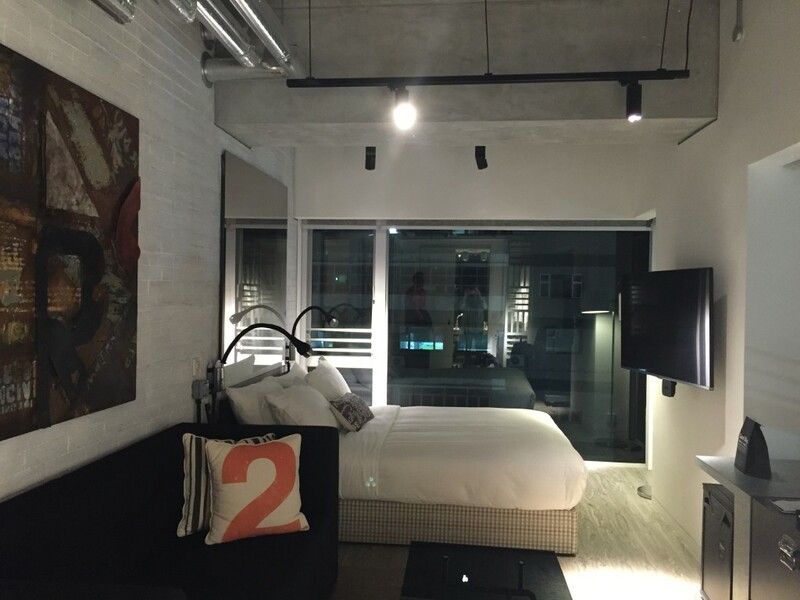 Our room at the Ovolo Southside—a small, but modern/industrial space filled with simple and elegant furniture on the sixteenth floor. 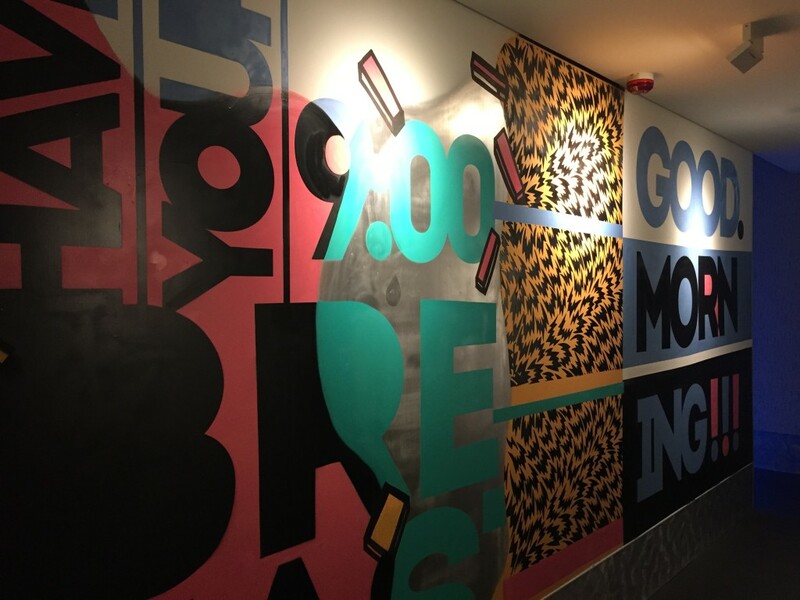 Wall decor inside the Ovolo hotel. CIRQLE Restaurant for dinner—pasta with truffles, a Moroccan baked eggplant dish with hummus and rice, and truffle fries (not pictured). 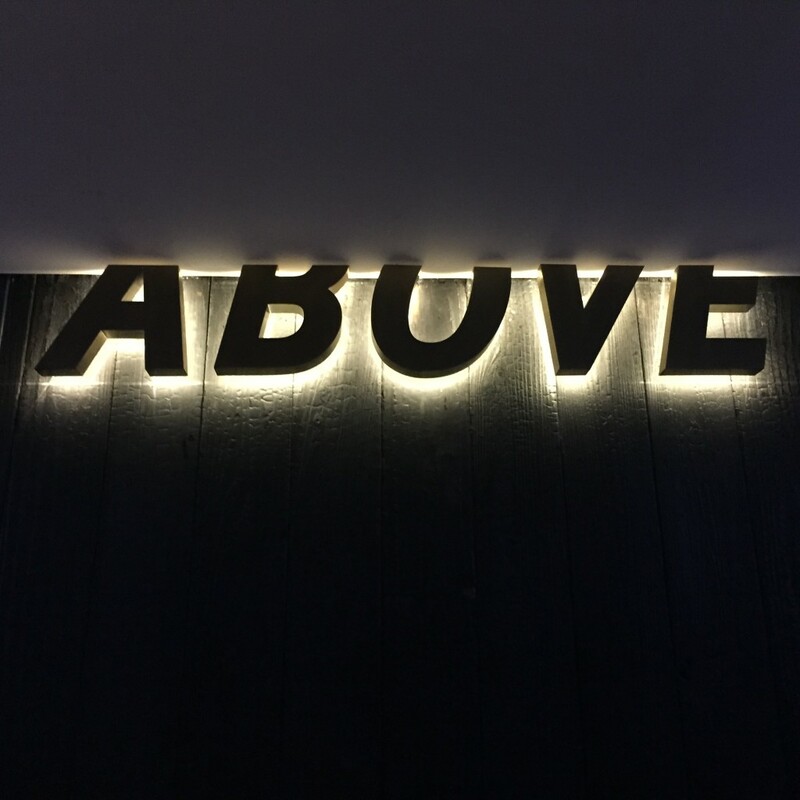 The logo for ABOVE—the rooftop bar at the Ovolo Hotel. Posing for a quick shot overlooking the skyline at ABOVE rooftop bar at the Ovolo Hotel. First night in cold weather in over a month. Friday morning we woke up and went down to CIRQLE for breakfast (a delicious spread) and then took a double decker bus to Kowloon. We started off on Nathan Street looking for Sam’s Tailor, but were informed that we didn’t have enough time in Hong Kong for fittings—womp womp. Afterwards, we went to Victoria Harbor City mall (which we thought was called Victoria Habba due to local accents) to get Daniel a pair of nice pants and grab lunch. We ate take-out sushi in the food court and it was absolutely delicious (but next to impossible to get a table). Fresh sushi in Hong Kong for lunch straight from the take out counter. 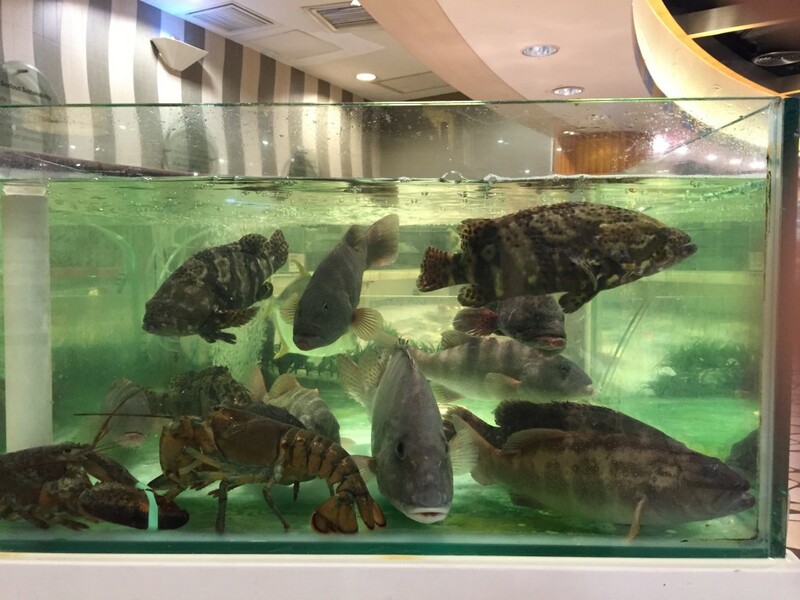 Just kidding—maybe…directly next to the fish tank is where the sushi is….very fishy. Ready for a day of exploring shops (or shopping) we headed to Granville Road to check out the local attire. We later learned that aside from the malls, most shops here don’t open until around 3:00 PM—not quite sure why this is, but we thought it was pretty strange. We meandered down the street and found that most of the tiny shops you see street-side actually extend several stories up into massive buildings—very unique to Honk Kong. 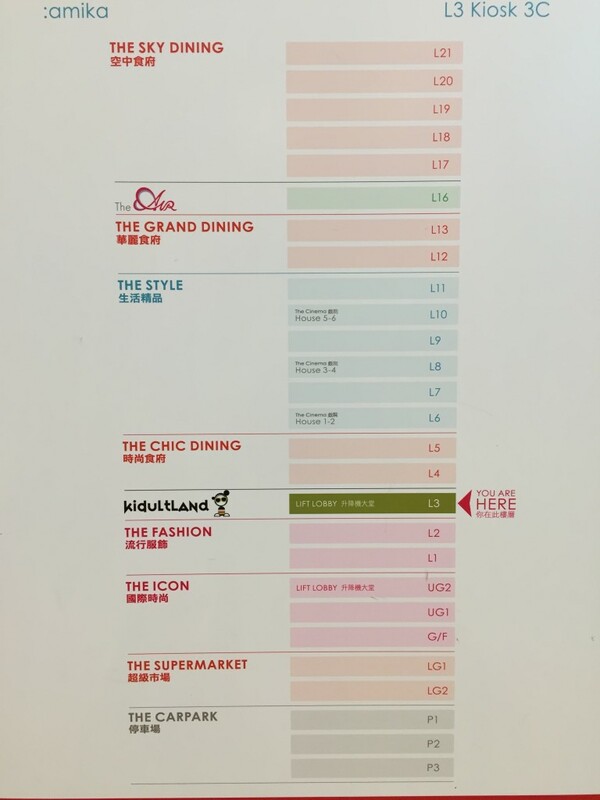 When more shops started to open, I stumbled upon a random entrance to a nine-story “shopping mall” filled with about thirty 8×8 foot stalls per floor. It felt like we entered some secret realm that kept unfolding. I found a few things to buy and then we left. 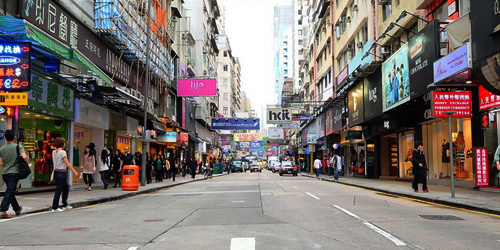 Grandville Road Hong Kong (not our photo). Later on, Daniel went to get a haircut (he’s never looked better) while I went to some huge mall where they refer to everything as “THE _____” (e.g. 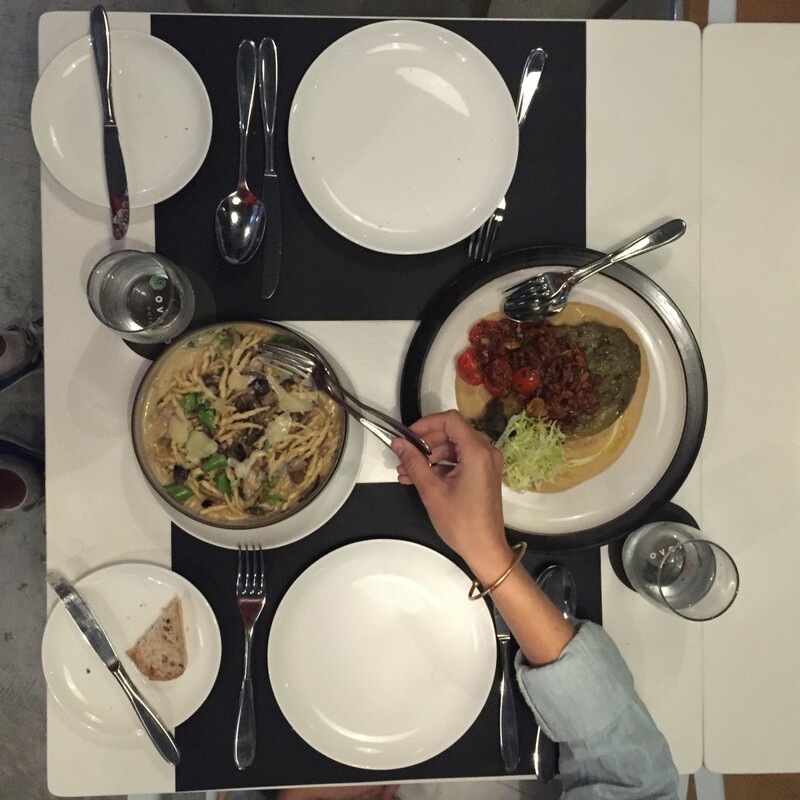 The Fashion, The Food, The Beauty, etc.) Eventually we took the bus back to our hotel, showered, changed, and went to an Italian restaurant called Sepa. The place was beautiful, the food was incredible, and the service was horrible (I think we waited over an hour and a half for our first dish to come). 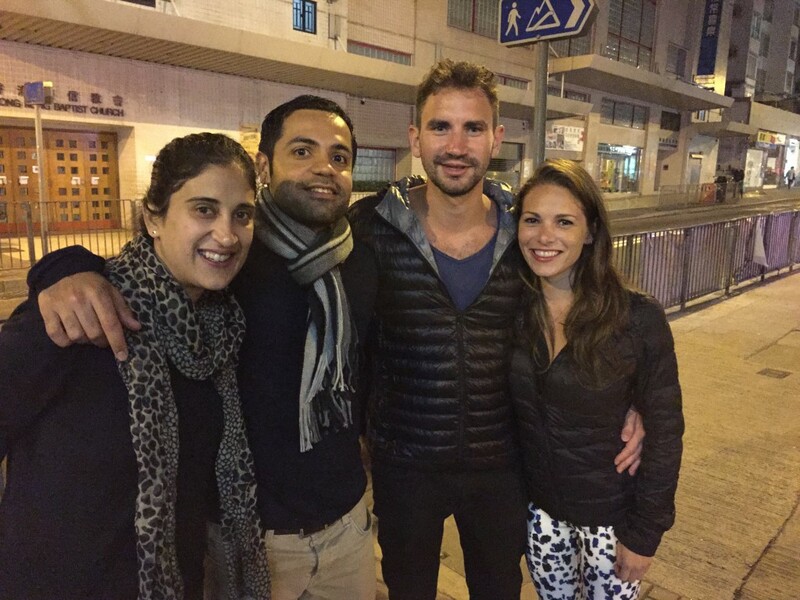 Nevertheless, that didn’t seem to matter as we made friends with a local couple at the bar (Dheeraj and Rada) and spent three hours drinking and eating together. We really enjoyed their company! 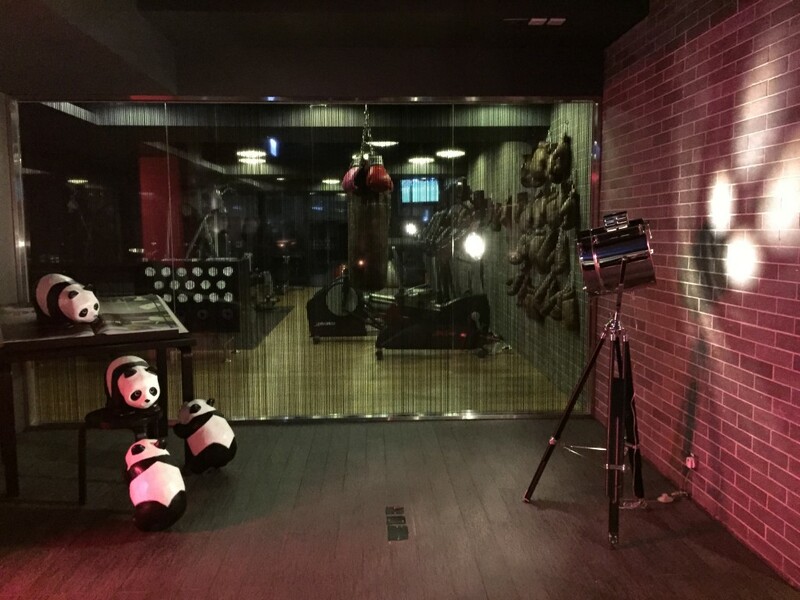 After dinner Daniel and I walked down to Long Kwai Fong (LKF) to check out the nightlife scene and eventually went back to the Ovolo to pass out. Daniel’s spiffy new haircut he’s never looked better! 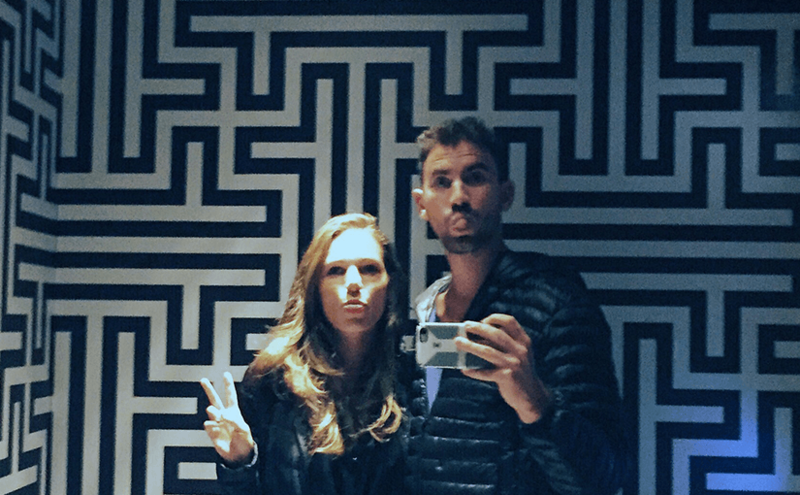 Selfie in the Ovolo elevator. Outside of Sepa Restaurant with our new friends Rada and Dheeraj. 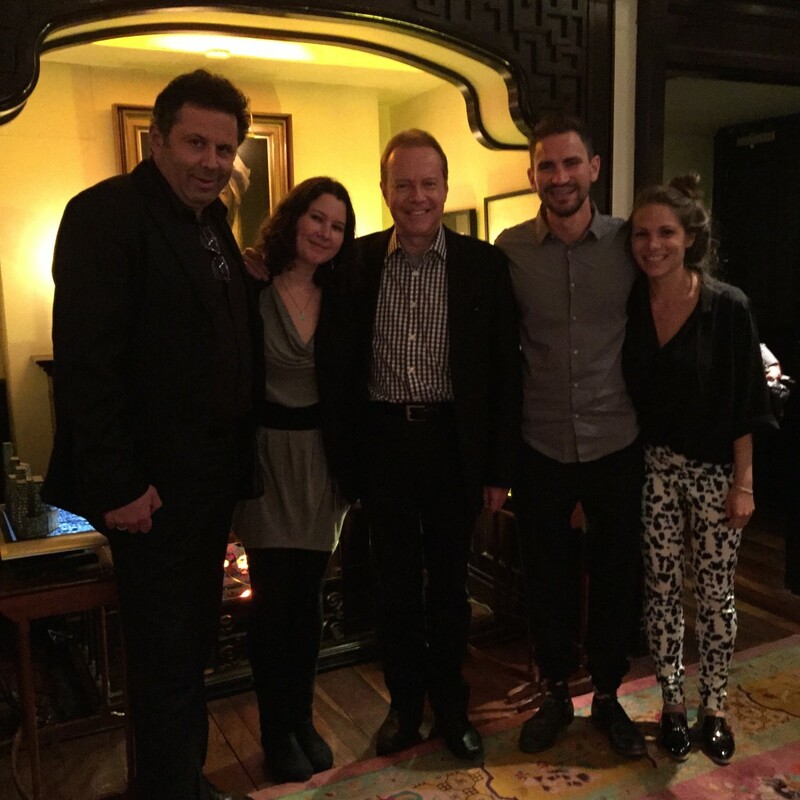 We really enjoyed their company!